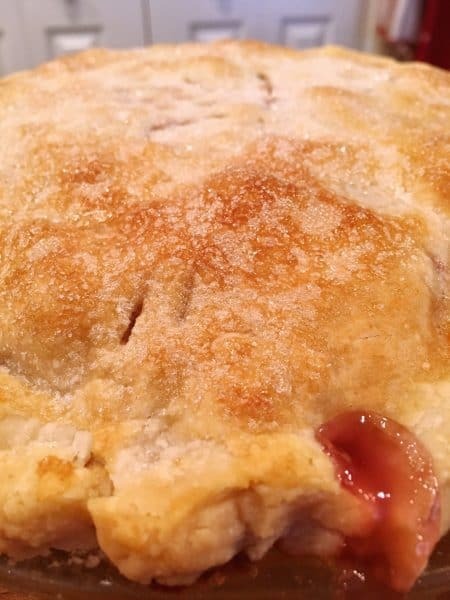 Cherry pie was my Grandpa Howard’s favorite! 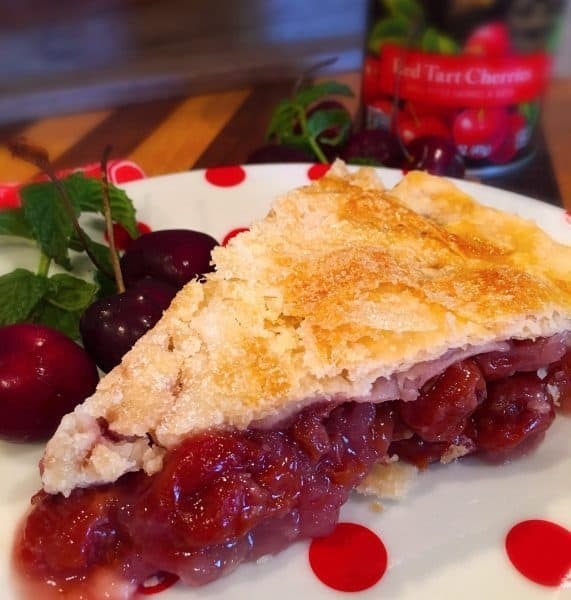 Cherry Pie made with canned tart cherries, in a slightly sweet filling, with a hint of almond extract, and a tender flaky crust was his one great dessert weakness…well that and Strawberry Shortcake! I can completely understand why Grandpa loved Cherry Pie so much! I’m a huge Cherry fan myself! 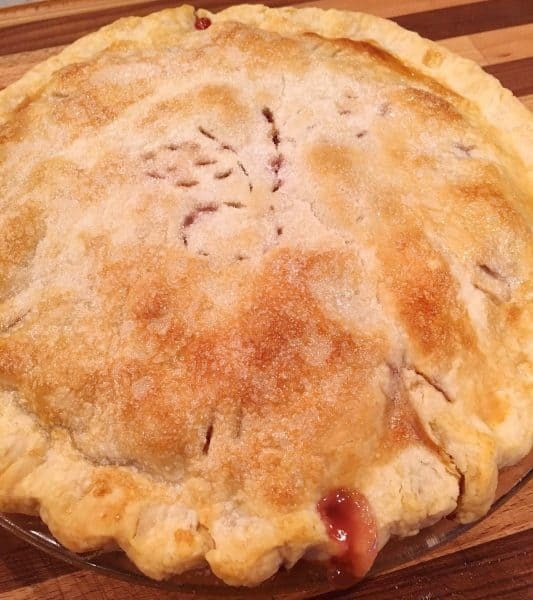 I may not make Cherry Pie every week…but when I do…this is the one I make! I wish I could tell you it’s 100% my recipe, but that would be a lie. My friend Betty Crocker knew what she was doing. I just improved upon it a tad. Start off with a double 9 inch pie crust. You can make it from scratch or store-bought dough. I won’t judge. 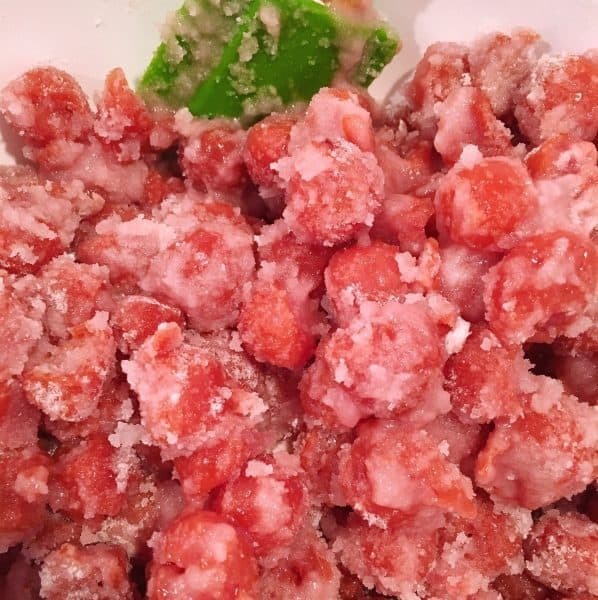 If you’d like my recipe you can click HERE to find it. It’s the only recipe I ever use. You just can’t beat a good Crisco crust! The flaky layers are to die for! 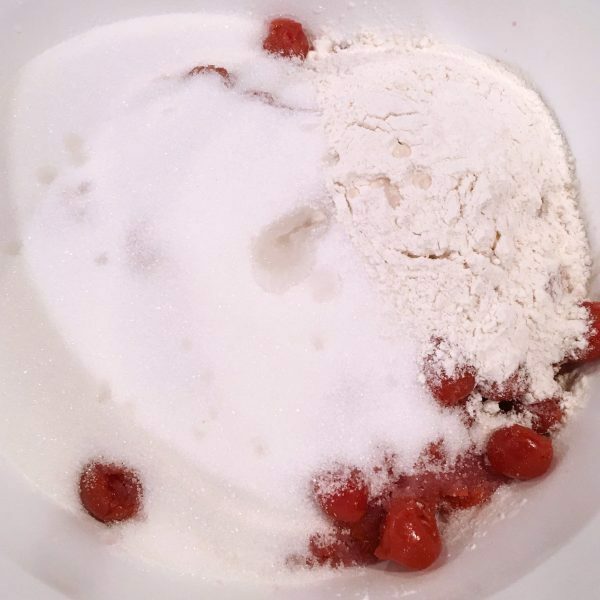 In a bowl add 1 1/2 cups of sugar with 1/3 cup + 2 Tablespoons of all-purpose flour to drained cherries. Gently stir! When mixed allow them to sit for about 5-10 minutes. They need to “chill” out for a minute! They’ve been through a lot with all that “pitting” and water soaking! Roll out bottom Pie dough. 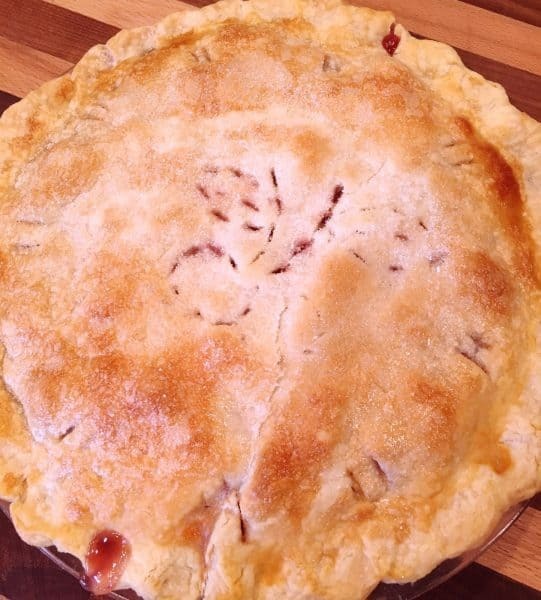 Turn cherry mixture onto pastry-lined pie plate. Sprinkle with 1/4 teaspoon almond extract and dot with 2 Tablespoons of butter. Look at all those cherries! This post contains affiliate links. Please read my Disclaimer page for more information. Roll out top crust. I love to my dough disc! I’ve raved about it over and over here on my blog. 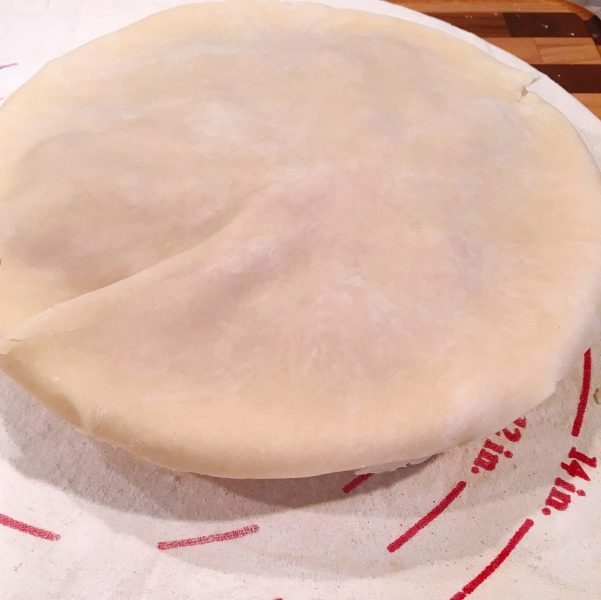 If you’re looking for a quick easy way to roll out pie crust, biscuits, rolls, or sugar cookies…your kitchen needs an amazing dough disc! 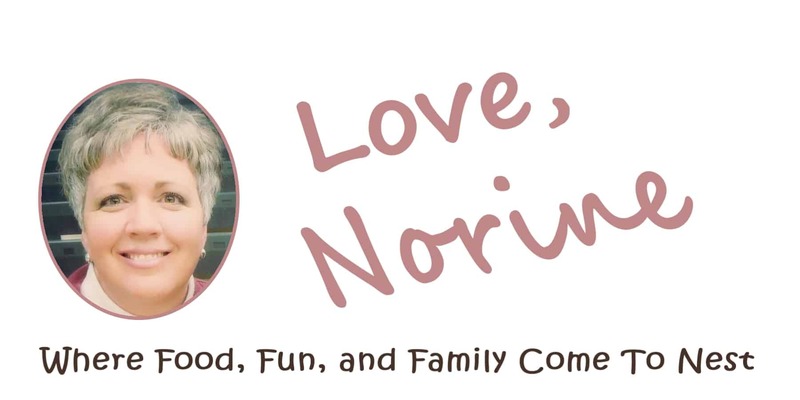 You can click HERE to find the exact one I use every week here at Norine’s Nest. I couldn’t make it through without this dough disc! To me it’s right up there with my baby…my kitchen aid mixer! 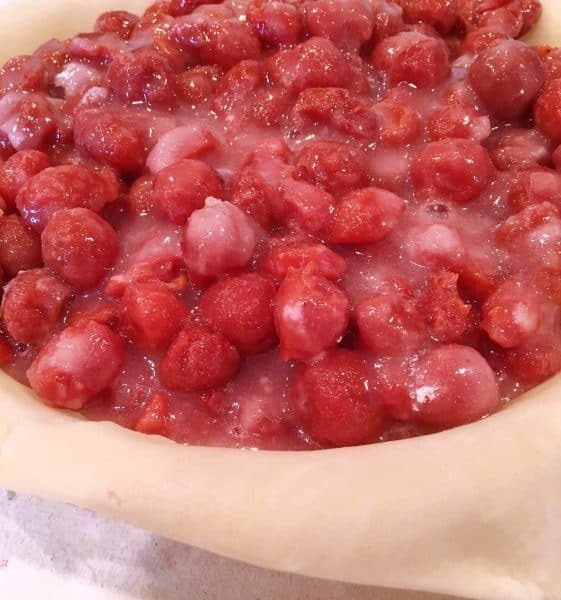 Cover Cherry Pie filling with top crust. Trim around the outer edge of the pie plate with kitchen shears. Fold edges under to seal and flute. TIP: “Flute” means to crimp your edges! I know a lot of bakers prefer to cut slits into their pie crust tops before placing it over the fruit filling. I do it opposite and for a reason. It’s much easier to move that rolled out pie crust if it is one piece with no cuts. It prevents the crust from falling apart. 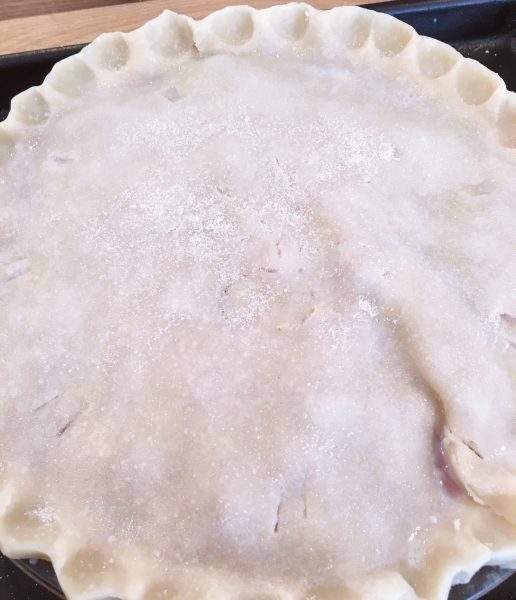 Cut slits into the top of your pie crust with a sharp knife. I did a Cherry motif. (Move over Van Gogh!) It seemed fitting! Place on a non-stick baking sheet and place in the oven for 15 minutes at 425°. Reduce heat to 350° and continue to bake for another 30-40 minutes. The baking sheet will prevent any run-off from burning in the bottom of the oven! TIP: If pie is beginning to get too brown, but the juices haven’t begun to bubble through the slits, make a “tent” out of a large piece of aluminium foil, and place it over the top of the pie for the final few minutes of baking. Bake until crust is brown and juice begins to bubble through the slits in the crust. Allow to cool for 45 minutes for “soft set” or completely cool for a firmer set. I wanted warm Cherry Pie with my scoop of Vanilla Ice Cream! So my slice isn’t super firm. Ya know what would go with this even better than Vanilla Ice Cream? A big scoop of my recipe for Cherry Chocolate Chip No-Churn Ice Cream! How heavenly would that be? I’m sure food photographers would have a lot to say about this photo with its crumbling flaky crust! I love a delicious flaky crust over a thick hard crust any day! I prefer to look at this photo and admire that flaky flake! That’s because I know… it melts in your mouth! It also creates the perfect “crust” edge! Mmmmmm! Remember to follow me on Pinterest, Facebook, and Instagram. 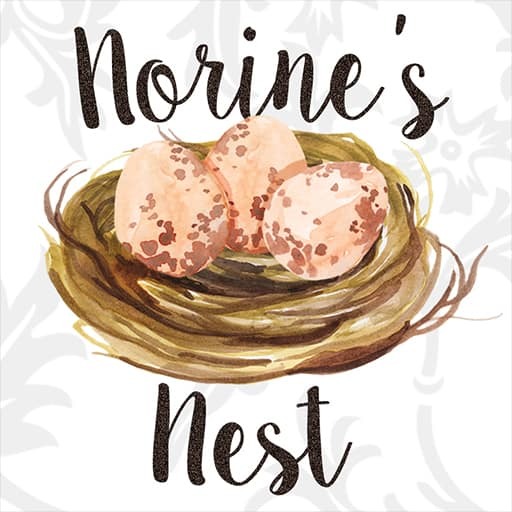 You can find me by searching for “Norine’s Nest”! It’s my favorite place to hang out! I hope it’s yours too! I’m sharing this family favorite over on the Weekend Potluck. Click HERE to join the fun! Psssst…I’m sharing this recipe over on Meal Plan Monday! 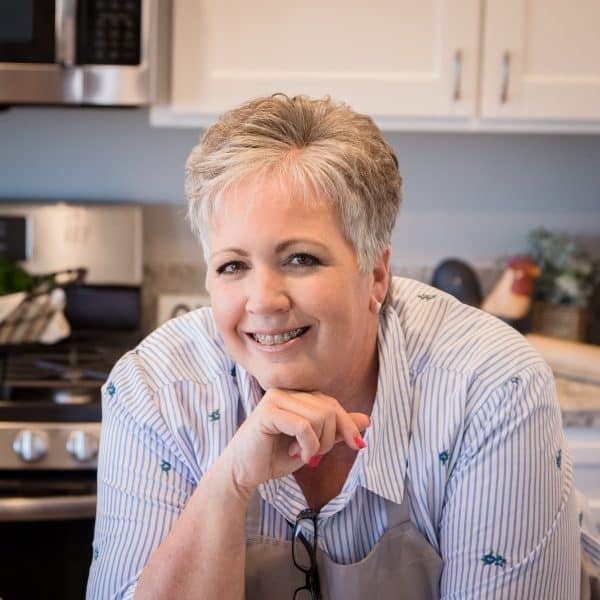 Click HERE to find recipes from some of my favorite bloggers. 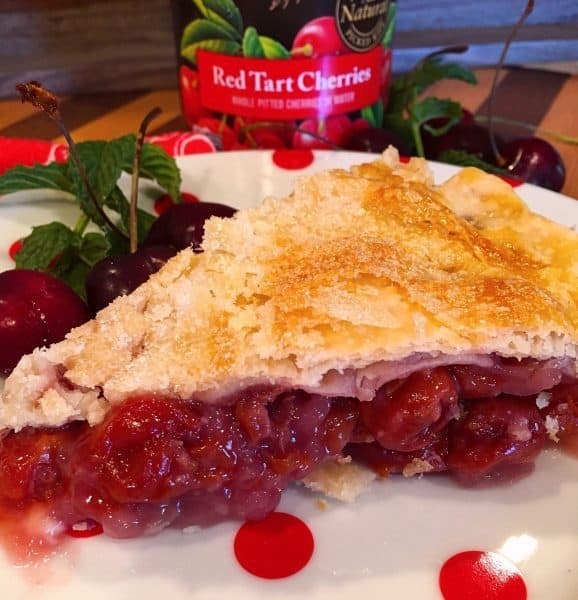 Traditional Tart Cherry Pie is the perfect slice of happiness for Cherry lovers all over the world. 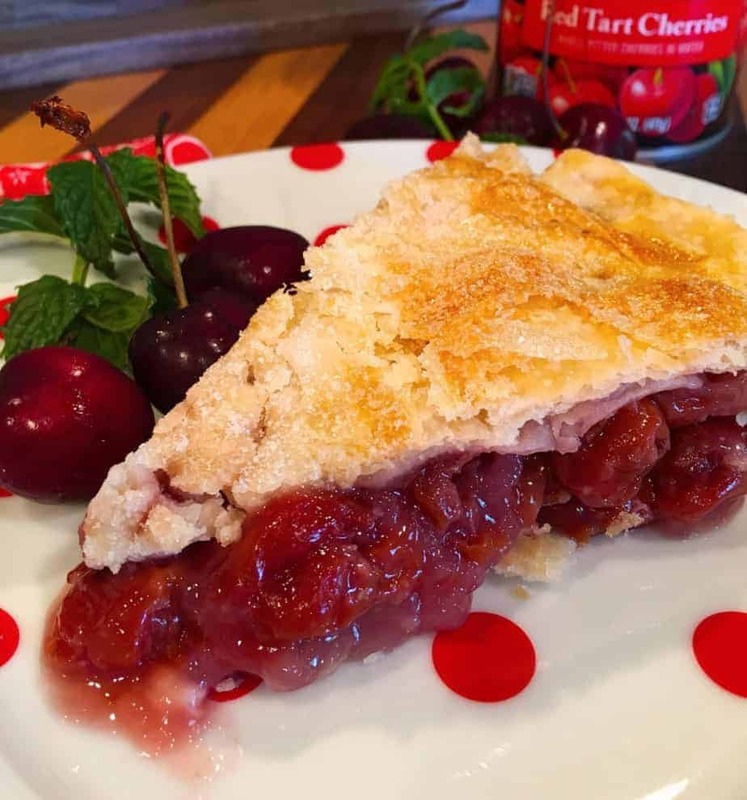 Plump, ripe, tart cherries are balanced with a sweet filling and wrapped up in a flaky crust. Drain Cherries. Add Flour and Sugar. Gently Stir. Allow to rest 5-10 minutes. Turn into pastry-lined pie plate; sprinkle with almond extract and dot with butter. Cover with top crust. Trim pie crust about 1/4 inch from outer rim of pie plate. Fold Under. Flute edges. Cut slits into top of pie. Brush with milk and sprinkle with sugar. Place on a baking sheet and bake for 15 minutes at 425°. Turn down to 325° and continue baking for an additional 30-40 minutes. Until crust is brown and juice begins to bubble through slits in crust. If crust is too brown before juices bubble, cover with foil tent. Thank you SO much for all your support, friendship, and love! You are a true girlfriend! Thank you for stopping by and sharing your kind words with me! You are the BEST!! !